The internet is opening up access to posters from a wider variety of countries. Collectors are finally getting to see some of the fantastic artwork and diversity of posters that have been issued over the years but have gone unseen until now. The problem is that it has also opened up more possibilities of mistakes and problems. NO ONE wants buy a poster and later find out it's NOT what you were thought it was. While you may be very familiar with the posters from your own country, our LAIMP book gives you basic and intermediate information so you can become more familiar with the details and wider variety of markings from most developed countries. Of course, more emphasis is placed on the larger countries with more detail to ratings and censorship. 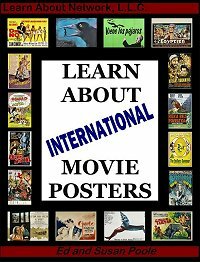 LAMP's Learn About International Movie Posters presents a closer look at the film industry in major countries around the world from the viewpoint of the poster collector. *How and when the film industry was introduced in each country. *Overview of the film industry in that country. And much much more. This book is CRAMMED with information that will help each and every dealer and collector no matter WHAT level you are at.